Mirror file photo by Brian Yermal Jr. / Two upcoming events will be held at the abandoned Pennsylvania Turnpike, including an open house with music, food and bus trips and a marathon and half-marathon. That hasn’t stopped county officials, tourism promoters and outdoor groups from gathering crowds and tours at the stretch of decades-old abandoned road. 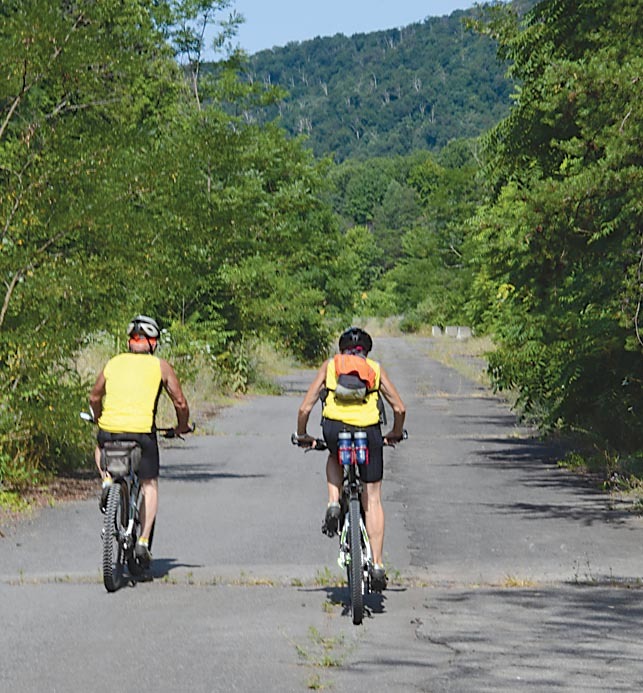 Since officials in Bedford and Fulton counties first seriously discussed opening the road as a tourist attraction a few years ago, groups have been increasingly willing to gather there with a stamp of formal approval. Full-scale development is still a ways off, but the change is clear, Bedford County Planning Director Donald Schwartz said. The change includes a planned festival with bus tours this weekend, as well as a first-ever marathon scheduled next month. It’s a far cry from the time when the only guests at the turnpike were a few daring hikers and teenagers with spray-paint cans. “Nothing has changed” in the legal sense, Schwartz stressed this week — access to the site is still officially limited by the Southern Alleghenies Conservancy, the nonprofit body that maintains it. Mirror file photo by Brian Yermal Jr. / Bicyclists ride on a portion of the abandoned Pennsylvania Turnpike. A marathon and half-marathon are planned on the former roadway Oct. 29. “But the committee members and I recognize that, in order for this project to be viable in the future, in some way it has to be self-sustaining,” he said. With that in mind, local officials have planned an open house this Saturday. Starting at the former Ramada Inn parking lot in Breezewood, across Route 30 from the modern Quality Inn, the event will feature food trucks, live music and trips to the nearby abandoned road, organizers said. 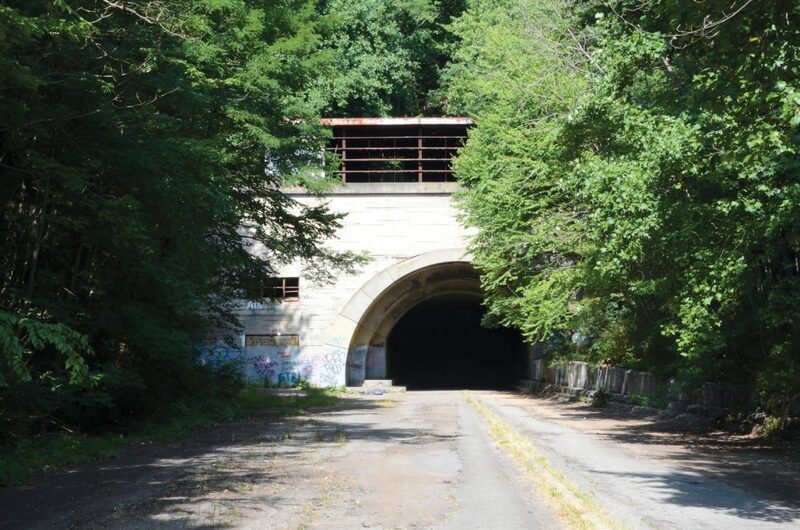 Schwartz said guests can take shuttle buses to the middle of the abandoned turnpike, which stretches 13 miles total with two long, dark tunnels. Organizers plan to test tunnel lighting options during the event, he said. Just over a month after the open house, Trivium Racing, a company that organizes outdoor events, is set to host a first-ever marathon and half-marathon through the turnpike. Advertising the site for its post-apocalyptic qualities — it was used for a scene in the dark 2009 film “The Road” — the company stressed that racers need to take their own lights. “While our water stops will be dressed up for the apocalypse and the awards will be appropriately themed, the event itself will be the height of modern professionally managed racing for a half and full marathon on a unique road setting,” company representatives wrote of the Oct. 29 run. The marathon, like all public events at the abandoned turnpike, was arranged with approval from the conservancy. Other groups have gathered there in recent years, from official tours with state politicians to corporate-sponsored cleanups. The gradual opening of the turnpike could help prove its moneymaking prospects as backers seek funding, Schwartz said. Local officials have sought help from political figures to pay for expensive repairs and upgrades.